Have you heard that Lyft deactivates any drivers that fall below 4.8. Uber is much better with allowing 4.70 as their minimum score. Want proof that a .10 can make a huge difference? Check out this entire website and you will see that Lyft drivers get deactivated often, and even a week before Christmas when their last 100 rated rides drop to 4.79. A ridesharing driver experienced this fate, which quickly occurred after they drove a drunk Dutch girl. She gave them passive aggressive feedback and rated them extremely low. A "1" star rating and bad feedback spell out deactivation. What was the female rider's main motivation? The female rider paid $10 for her 1.3 mile ride. She indicated this ride should've cost her much less because the distance to to her home was only 1 mile away. However, she didn't know the directions (intoxicated), so the driver pulled over and made sure to reach this destination. The rider wanted the ridesharing driver to go down one-way streets, which the driver would never do because this increases safety risks. This feedback is protected content on Yelp. We are showing this feedback here to demonstrate that these reviews are 100% accurate. 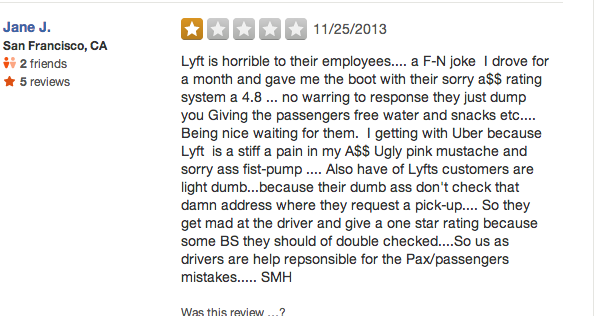 Many Lyft riders are uneducated about this rating system. They've taken part in deactivating drivers, terminating them for complaining about a missed turn, being over friendly, talking too much, challenging a cancellation fee and a bunch of other absurd things. We can verify that 4.79 will get a driver deactivated right way. Lyft will never share exact feedback or ratings from specific riders. Lyft claims that ratings and feedback are concealed to protect the privacy of riders. Ridesharing drivers will never know what people are saying about them. This is a poor rating system where a driver wants to give a rider a low score but feels bad since they have a 5.0. One girl named Spanish Omelette deserved to get a 1.0, as she rated a driver a 1 star just because they talked to her. She made up a false story regarding the destination being 1-mile off. This passenger got dropped off at the exact location she requested. If this destination was her mistake, she could easily have mentioned this and this driver would have driven her. Beware of this rider. She has no idea that Lyft is not a taxi service and is clueless about what ridesharing services actually are. Uber is a class act for allowing drivers to remain with a 4.7 rating, whereas Lyft is a cold ride-sharing company that deactivates any driver who dips below 4.80. Lyft's ineffective business model functions as a computer-generated system that flags driving accounts that reach their minimum requirements. It is possible they believe that using ratings is the best way to get rid of what this ridesharing company measures as poor drivers. In our opinion, Lyft probably views lower scores as a risk to their passenger base. In perspective, drivers falling in the lowest 5 percent may drag down the overall rating of this ridesharing company as a whole. It is likely that Lyft assumes high ratings are more appealing to the public and this helps them to sell their ridesharing services to the general transportation community. Think twice before driving for Lyft. SideCar available in San Francisco and its Bay Area, San Diego, Los Angeles and Long Beach, San Diego, Chicago, Seattle, Charlotte N.C., Washington D.C., and Boston.